Coors Field is the site of the matchup between the San Diego Padres and the Colorado Rockies on Sunday, September 17, 2017. The probable starting pitchers are Jhoulys Chacin for the Padres and Jon Gray for the Rockies. San Diego opens at +194 while Colorado opens at -210. The Padres have a 74-65-8 over/under record and a 79-68-0 run line mark. The Rockies are 76-72-0 against the run line and have a 61-80-7 over/under record. The Padres have a 65-82 overall record this season. Starting pitcher Jhoulys Chacin has a 12-10 record with an earned run average of 4.06 and a WHIP of 1.29. He has 137 strikeouts over his 164 innings pitched and he's given up 146 hits. He allows 8 hits per 9 innings and he has a FIP of 4.42. The bullpen has an earned run average of 4.42 and they have given up 438 base hits on the year. Teams are hitting .230 against the bullpen and they've struck out 535 hitters and walked 184 batters. As a team, San Diego allows 8.8 hits per nine innings while striking out 8.4 batters per nine innings. They are 16th in the league in team earned run average at 4.55. The Padres pitchers collectively have given up 1,276 base hits and 658 earned runs. They have allowed 203 home runs this season, ranking them 7th in the league. San Diego as a pitching staff has walked 495 batters and struck out 1,209. They have walked 3.4 men per 9 innings while striking out 8.4 per 9. They have a team WHIP of 1.36 and their FIP as a unit is 4.63. As a team San Diego is hitting .233, good for 30th in the league. The Padres hold a .394 team slugging percentage and an on-base percentage of .299, which is good for 30th in baseball. They rank 30th in MLB with 7.7 hits per game. Manuel Margot is hitting .265 with an on-base percentage of .314. He has 117 hits this season in 441 at bats with 38 runs batted in. He has a slugging percentage of .417 and an OPS+ of 94. Wil Myers is hitting .244 this year and he has an on-base percentage of .327. He has totaled 127 hits and he has driven in 71 men in 520 at bats. His OPS+ is 109 while his slugging percentage is at .465. The Padres have 1,135 hits, including 204 doubles and 173 home runs. San Diego has walked 423 times so far this season and they have struck out 1,358 times as a unit. They have left 939 men on base and have a team OPS of .693. They score 3.8 runs per contest and have scored a total of 558 runs this year. Colorado has a 81-67 overall mark this year. With an earned run average of 3.95, Jon Gray has a 8-4 record and a 1.37 WHIP. He has 92 strikeouts over the 93.1 innings he's pitched. He's also given up 100 hits. He allows 9.6 hits per nine innings and his FIP stands at 3.4. The bullpen has an earned run average of 4.37 and they have given up 485 base hits on the year. Teams are hitting .248 against the Rockies bullpen. Their relievers have struck out 499 batters and walked 192 opposing hitters. As a team, Colorado allows 9.1 hits per nine innings while striking out 7.9 batters per nine innings. They are 18th in the league in team earned run average at 4.6. The Rockies pitchers as a team have surrendered 1,336 base knocks and 672 earned runs this season. They have given up 181 home runs this year, which ranks 15th in Major League Baseball. Colorado as a staff has walked 493 hitters and struck out 1,160 batters. They give up a walk 3.4 times per 9 innings while they strike out 7.9 per 9. Their team WHIP is 1.39 while their FIP as a staff is 4.41. As a team, they are batting .271, good for 2nd in the league. The Rockies hold a .442 team slugging percentage and an on-base percentage of .335, which is good for 6th in baseball. They rank 2nd in MLB with 9.3 hits per contest. Charlie Blackmon comes into this matchup batting .332 with an OBP of .398. He has 196 hits this year along with 89 RBI in 591 AB's. He maintains a slugging percentage of .606 with an OPS+ of 143. 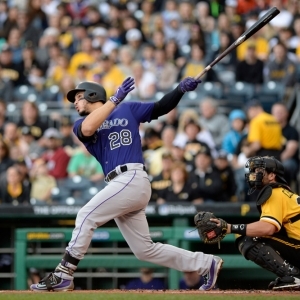 Nolan Arenado is hitting .308 this season and he has an OBP of .371. He has collected 173 hits in 561 at bats while driving in 124 runs. He has an OPS+ of 132 and a slugging percentage of .590. The Rockies as a unit have 1,370 base hits, including 273 doubles and 175 homers. Colorado has walked 465 times this year and they have struck out on 1,299 occasions. They have had 988 men left on base and have an OPS of .777. They have scored 5.07 runs per game and totaled 750 runs this season.